The horror genre is full of cliché and expectation, which means it is becoming increasingly tough to achieve originality when making a film of this ilk. 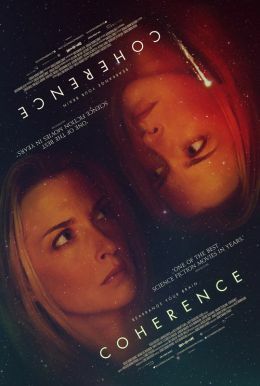 'Stay away from the door' and 'we should stay together' have become part of the scary movies culture but low-budget sci-fi chiller 'Coherence', the first feature from director James Ward Byrkit, cleverly takes the tired formula and refreshes it. The film largely takes place within an intimate house where a dinner party is being held, on the night that a comet is due to pass through our skies. When signals fail, phone screens shatter at random and the power goes out across the neighbourhood, the group of friends realise that all it not as it should be. Shot using the shaky-cam method, a paranormal activity documentary vibe is established early on. As characters are introduced, they are zoomed in upon and interrogated with an array of extreme close ups. Abrupt cuts are used, stopping at black a little longer than we are used to. These techniques help to quickly create an unnerving atmosphere that refuses to lift throughout. As the strange events escalate into chaos, the fracturing relationships between the supposed close-knit gang are explored, and put to the test. The reality of what we are witnessing becomes unclear as the intricacies of the narrative go into overdrive, while the director playfully subverts our preconceptions, though the score and dialogue do venture into rather familiar territory. The film is well acted throughout, and I particularly enjoyed Nicholas Brendon's performance as the dinner party host Mike. He injects a shot of humour that is consistently judged, without ever overstepping the mark. Because there are eight characters to meet, they can't all be developed fully which effectively adds to the mystique. Details are revealed in small stages, so personas and problems creep into the story while they come to terms with the situation they are faced with. 'Coherence' is too intelligent a film to thrust the horror in the face of audience and instead it allows the viewer to think through possibilities, letting our imaginations conjure up the terror as the plot twists. This represents a stunning display of low-budget film-making. The relationship turned love triangle involving central figure Emily, played by Emily Baldoni, adds another interesting dimension that distracts from the real issue at hand occasionally. A hand written message is stuck on the door of the house about halfway through which starts 'Guys, I don't want this to freak you out...' I am afraid it is far too late for that.